Between SAP Suite on HANA and SAP S/4HANA, some level of confusion still exist which I got know after speaking with a large number of people. For those who are wrestling with the differences between the two products let me provide some clarity. Before making any decisions it goes without saying that it is vital to understand the contrasts in the journey to each product and their functionality. First came, SAP Suite on HANA. On SAP HANA the traditional SAP ECC solution is available as the name suggested. The engine (database) is now a HANA engine although it has all of the traditional functionality of an ECC environment. There is no concept of data simplification as nearly all of the SAP transaction codes are available. To create real-time reporting one can access to the HANA live studio. To utilise the HANA Database and provide additional performance benefits the solution also boasts amended transactions. On HANA the route to Suite to digest is pretty simple. From your current database to HANA it should be upgraded to ECC6 Enhancement Package 7 and then a database migration should be performed. Without too much business involvement this technical exercise can be achieved (regression testing is a must). Simplification of the data has been done. Within certain processes into a single table by replacing the core tables this can be achieved. Due to the ‘principle of one’, some traditional functionality is no longer available after the new functionality has been released. With over 3000 CDS views currently available embedded reporting has been released. Within the S/4HANA environment, SAP BW and SAP BPC can be embedded. Within the new product S/4HANA enables certain scenarios to be performed– not all however; it will not replace BW or BPC. Either by a system conversion from an ECC solution (including Suite on HANA), or a new install the route to S/4HANA is achieved. 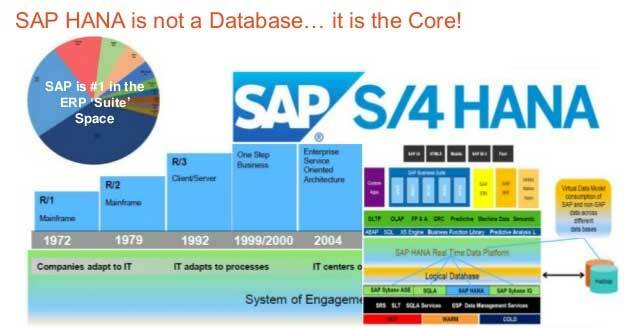 From ECC6 to S/4HANA there is no upgrade path. With the reason being to enable the new simplified data model a system conversion needs to take place. In order to replace it from your existing system you need to be conscious on the lost functionality as part of the move to S4/HANA. The on-premise S/4HANA solution is of two versions. With a simplified Finance module and full ECC scope SAP S/4HANA Finance is the one which is Suite on HANA. Availability of this product is still there and soon a new release is due. Materials Management and Operations as well as Finance are simplified by SAP S/4HANA Enterprise Management. By “S4CORE” “SAP_APPL” has been replaced which has a different base component. In ECC there are modules which have been replaced. Still there is an evolution of each of these products and therefore what you currently have in your ECC solution may not provide all of the functionality you with certain Industry Solution functionality which is not yet available. Within S/4HANA Enterprise Management Modules in the roadmap to be simplified modules such as Production Planning and Quality Management are there. Although the functionality will still be available within S/4HANA the HR module will not be simplified. Please review the last paragraph. Still there is an evolution of each of these products and therefore what you currently have in your ECC solution may not provide all of the functionality ?you? with certain Industry Solution functionality which is not yet available. Within S/4HANA Enterprise Management Modules in the roadmap to ?be? simplified modules such as Production Planning and Quality Management are there. We would like to implement SAP in our organization, which is better ECC 6.0 with Hana database or S4 Hana. We have around 75 SAP licences taken over.